Weierhof, a hamlet at the foot of the Donnersberg near Marnheim, Palatinate, Germany (coordinates: 49.633654°, 8.028664° [49° 38′ 1.15″ N, 8° 1′ 43.19″ E]), the center of a Mennonite congregation. It was originally (from 835) the property of a monastery, then was secularized in 1564, destroyed in the Thirty Years' War, and in 1682 given in hereditary lease to the "Mennonist" Peter Crayenbühl (Krehbiel). In his letter to the elector negotiating for the estate, Crayenbühl requested that he and his family be permitted to perform their worship unmolested. The position taken by the Protestant state church council to this request states, "The church council is of the opinion . . . that what the petitioner wants to read and pray in his house with his children cannot be refused him, but it would have to be done with the express restriction that he will not take on any Anabaptist help or admit any other persons of the Anabaptist sect and under any pretext or appearance form a congregation of them. Otherwise he shall lose even this particular concession and be expelled." This was in principle the attitude of the time toward the Mennonites who were settling in the region. According to the lists of Mennonites in the Generallandesarchiv in Karlsruhe the following were named in 1685 in the territory now included in the Weierhof congregation: Elbisheimerhöfe, Braun Herbach with five children, and Christoffel Gohl with three children; in Marnheim, Martin Tempel's widow and seven children; in Weierhof, Peter Crayenbühl with nine children, six of them sons; two were married and living on the home place, viz., Ulrich with three children and Peter with one child; on Heyerhof, Ulrich Burkard with one daughter, Jacob Trinkener with two sons and a daughter, Felix Berky with two sons; Peter Brubacher, no children; in Immesheim, one family; in 1686 in the Bolanden district 10 families with 32 children; in 1687 at Marnheim and Elbisheimerhof, one family. But very soon a decided change took place. In 1706 the Weierhof with other estates and villages passed into the jurisdiction of Nassau-Weilburg, whose rulers were less intolerant toward the Mennonites than the Catholic electors of the Palatinate. It is probable that a congregation was organized at this time, though the contract as late as 1770 stipulated that the lessee was permitted to worship with his own family, but not to admit anybody else. An almsbook, which goes back to 1716, indicates that the congregations of Weierhof and Erbesbüdesheim held their services together, alternating between the two places. Christel Krehbiel was the deacon. As far as is known there were many Mennonites living in the villages and farms of the vicinity, as in Albisheim, Bennhausen, Bolanderhof, Donnersbergerhof, Froschauerhof, Gundheimerhof, Marnheim, Münsterhof, Neuhof, Niederwiesen, Rosenthalerhof, and Rüssingen. In 1748 the Erbesbüdesheim congregation became independent. In 1835 it resumed the former bonds with Weierhof, but was then known as the Uffhofen congregation; the two congregations jointly engaged Weierhof's first professional minister, Hermann Reeder, and continued this practice since. A list of Mennonites left of the Rhine drawn up in 1732 names twenty families on the Weierhof. The preachers were Rudolf Kägy at Niederwiesen and Hans Ellenberger; Jakob Hagmann was the deacon. A list of 1762 gives Ulrich Ellenberger, Hans Bürcky, Abraham Künzi, and Jakob Haury as elders and preachers. The Dutch Naamlijst of 1766 for "Rheingrafenstein, Erbesbüdesheim, and Weierhof" lists Ulrich Ellenberger, elder 1743; Christian Moser (1787 mentioned in the Rheingrafenstein congregation), Jakob Galle (in 1787 in the Erbesbüdesheim congregation, from Uffhofen), Jakob Herr (? ), Adam Krehbiel, Christian Krehbiel. The list of 1787 (partly in contradiction with the above, based on Reeder's report) names for the now independent congregation of Weierhof "bei Kirchheimbolanden": Adam Krehbiel 1758, Michael Krehbiel 1762, Rudolf Ellenberger 1766, Ulrich Krehbiel 1783. After the death of Ulrich Ellenberger (ca. 1765), Jost's son Adam Krehbiel took charge of the congregation. His faithful service and the love and devotion with which he always performed the duties of his office were attested again and again. Even in the 20th century his name "Adamvetter" lived on in tradition. He was a friend of Peter Weber of Hardenberg and shared his experience. It is possible that the petition of 1767 to the authorities of Nassau-Weilburg, requesting permission to hold services in their homes, originated with him. This request was apparently granted, for on 4 September 1769 another request was addressed to the prince by Heinrich, Adam, and Christian Krehbiel and Jakob Kägy, requesting permission to build a dwelling house with a room large enough for their services. This request apparently received no answer. Nevertheless they began to build the following spring, but had to stop upon government orders. Through the intervention of La Poitrie they, however, soon received the desired permission upon payment of a fee. 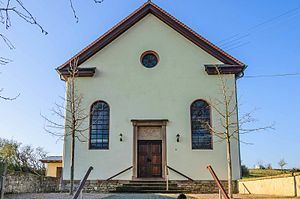 In the same year, perhaps in October 1770, the meetinghouse, known as "Die Lehr" was put into use, with the assistance of Jakob Galle of Uffhofen and Johannes Krehbiel of Wartenberg. In 1777 Christian Krehbiel took over the function of the deacon and treasurer. To support Adam Krehbiel, Michael Krehbiel of Donnersberg was ordained to the ministry in 1781 and Rudolf Ellenberger of Rüssingen in 1783. But in the 1790s they died, leaving Adam alone again. In consequence of the French Revolution the chapel was used as a soldiers' barracks, and was badly damaged. During this time the congregation again met in the home of Adam Krehbiel. The aged "Adamvetter" had by this time become quite feeble. Assistants chosen to support him were Johannes Krehbiel, his son-in-law, Johannes Stauffer of Bolanderhof (he died after preaching only two sermons), Jakob Brubacher of Albisheim, and Jakob Krehbiel, a grandson of Adam. Adamvetter died in 1794, mourned by the entire congregation as well as others who had a high regard for him. Now Johannes Bürcky of Albisheim and Michael Krehbiel II of Donnersberg were chosen as preachers; but Jakob had the burden of the responsibility. The Ibersheim conferences of 1793 and 1795 were attended by Jakob Krehbiel and his father Johannes representing Weierhof. In 1812-1813 the congregation acquired a cemetery. A plague-like epidemic carried by the soldiers fleeing from Russia struck many people, including Jakob Krehbiel and Johannes Bürcky. The congregation was then in a rather orphaned state. For a time the preachers of the neighboring congregations, especially Jakob Neff of Kriegsheim, looked after the elder's work, until a new election was held in 1816. Jakob Krehbiel of Pfrimmerhof and Georg Neukumeter of Bennhausen were chosen. The former in particular worked with devotion and fluency until he immigrated to America in 1827. As is shown in a booklet, he had drawn a small salary. The preachers then chosen had difficulty in consenting to take upon themselves the entire duty; also some dissensions had arisen within the congregation. Hermann Reeder, the preacher of the Neuwied congregation, made a visit at Weierhof and was chosen the first professional minister of the Weierhof congregation in 1835. He had received some training with the English Baptists and was therefore considered an educated man. The religious life of the congregation grew under his care. Church attendance increased to such an extent that a new church had to be built. On 1 November 1837 the new church, built on the plans of a Baptist chapel in Tottenham, England, was dedicated by Risser of Sembach, Jakob Ellenberger of Friedelsheim, and Molenaar of Monsheim. The entire cost was met by voluntary contributions. The contractor or supervisor of the erection was Jakob Krehbiel, a miller. In 1848 Reeder returned to Neuwied. Reeder's successor was Michael Löwenberg, who was in addition a teacher in the village. Upon his death in 1874 his son Thomas was chosen, who made a contribution especially in choral work. He served the congregation until 1882, when he accepted a call to Ibersheim. Shortly before he left he had begun a parsonage according to plans of his own. It was completed after his departure and acquired by the congregation. Until Johannes Krehbiel of Weierhof could complete his education, S. Blickensdörfer of Sembach looked after the congregation. In 1886 Johannes Krehbiel took over his work. But soon afterward he succumbed to a mysterious disease. The new choice fell upon Christian Neff of Ludwigshafen, who was ordained in the winter of 1887. He served the congregation without intermission until 1938, when his assistant, Paul Schowalter of the Kaplaneihof of the Deutschhof-Geisberg congregation, became his successor. During World War II Neff had to take charge of the Weierhof congregation once more until Schowalter's discharge from the army. During the long and blessed service of Christian Neff the Weierhof parsonage was a frequent center for visits by brethren from Germany and other countries. Americans, French, Dutch, Russian, and Swiss brethren came here to visit or to study. As preacher and pastor of his congregation, for decades as chairman of the Conference of South German Mennonites and many other Mennonite associations, as a competent scholar in Mennonite history, as a pillar of all German Mennonitism and beyond its borders, he will not be forgotten. He died on 30 December 1946, at the Weierhof. Weierhof very early (ca. 1800) had its own school, a sort of ministerial training school, which was after a period of interruptions built up by Michael Löwenberg and was finally to be developed into a secondary school with a boarding school. Known as the "Realanstalt am Donnersberg," under the leadership of Ernst and Gustav Göbel, it became known far beyond the Palatinate among Mennonites and non-Mennonites. Its music teacher, Lorenz Wettschureck, edited the musical part of the hymnal of the Conference of the South German Mennonites in 1910 and added four-part harmonization. Conferences of the Palatine and Hessian Mennonites were held at the Weierhof in 1830, 1873, 1882, 1890, 1900, 1911, 1925, 1933, and 1940. On 3 and 4 April 1918, there was a conference of Russian Mennonites, attended by about 20 persons, at which the question of the resettlement of Russian Mennonites was discussed in the light of the Revolution. Also the conferences of the leaders and ministers of the Palatinate and Rhenish Hesse were held annually in nearby Marnheim. Of special value to the religious life of the brotherhood were the Bible courses held at the Weierhof 1907-1914 by Jakob Vetter. After World War I they were resumed (with a few intermissions) by Jakob Kroeker, with the co-operation of the preachers of the Palatine-Hessian congregations as well as those of Switzerland. There were often visitors from many German congregations present. The Weierhof congregation is a member of the Konferenz der pfälzisch-hessischen Mennonitengemeinden, the Konferenz der süddeutschen Mennoniten, the Vereinigung der Deutschen Mennonitengemeinden, and the "funds" connected with this Vereinigung, and also of the Vereinigung der bairischen Mennonitengemeinden. After World War II Mennonite congregational life at the Weierhöf was considerably enriched with the reception of many refugees. The congregation at Ulffhofen joined Weierhof in 1972. A new orientation and the involvement of numerous members led to a stronger contribution of laity in worship; the establishment of cell groups; and the holding of a variety of events. A community center was built, 1965-1966. Peace witness became an important concern of the congregation. Preachers were Paul Schowalter (1938-1971), Hans Werner Janzen (1972-1981), and Willi Wiedemann (1982-). Christian Galle (1946-1969), Eckbert Driedger (1969-1987), and Gerhard Wiehler (1987-) served as chairmen of the congregation. Drieger, Eckbert. "Vom Weierhöfer Antrag bis zum Emder Beschluß." Brücke (1986): 88-89. Galle, Christian. "Der Weierhof im Wandel der Zeit." Mennonitisches Jahrbuch (Newton, 1955): 9-16. Haury, Helmut. "Schwierige Weichenstellungen: Die Weierhof-Jahre 1979 bis 1985 aus der Sicht des Trägervereins." Schriften des Gymnasiums Weierhof 1 (1985): 9 ff. Hege, Christian and Christian Neff. Mennonitisches Lexikon, 4 vols. Frankfurt & Weierhof: Hege; Karlsruhe: Schneider, 1913-1967: v. IV, 484-488. Hege, Peter. "Jugendwerk der Konferenz Süddeutscher Mennonitengemeinden (Juwe)." Mennonitisches Jahrbuch (1986): 110-11. Hertzler, Richard. "Das Hilfswerk der Vereinigung der Deutschen Mennonitengemeinden Weierhöfer Stelle." Der Mennonit (1961): 138-139. Waltner, Gary J., ed. 300 Jahre Mennonitengemeinde Weierhof 1682-1982. Waltner, Gary J. "Vorgestellt: Die Mennonitische Forschungsstelle." Mennonitische Blätter (1978): 43. Neff, Christian, Christian Galle and Helmut Haury. "Weierhof (Rheinland-Pfalz, Germany)." Global Anabaptist Mennonite Encyclopedia Online. 1990. Web. 23 Apr 2019. http://gameo.org/index.php?title=Weierhof_(Rheinland-Pfalz,_Germany)&oldid=146328. Neff, Christian, Christian Galle and Helmut Haury. (1990). Weierhof (Rheinland-Pfalz, Germany). Global Anabaptist Mennonite Encyclopedia Online. 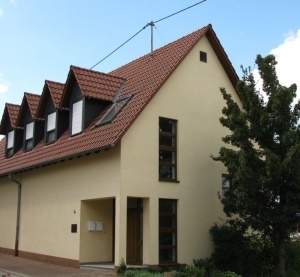 Retrieved 23 April 2019, from http://gameo.org/index.php?title=Weierhof_(Rheinland-Pfalz,_Germany)&oldid=146328. Adapted by permission of Herald Press, Harrisonburg, Virginia, from Mennonite Encyclopedia, Vol. 4, pp. 911-913; vol. 5, p. 926. All rights reserved.